I have artisan baguette taste, but I’m on a Wonder Bread kind of budget. This may be my current lot in life, and ‘waste not, want not’ are words to live by. So I buy au bon pain—aka the good bread— because a healthy body is the ultimate life investment. Ahem—do not be fooled by ‘enriched’ bread products; ‘enriched’ is a load of hooey, usually chemical and unnatural. All kinds of crusty bread work well—baguettes, ciabatta, sour or sweet batards, even old plain bagels. 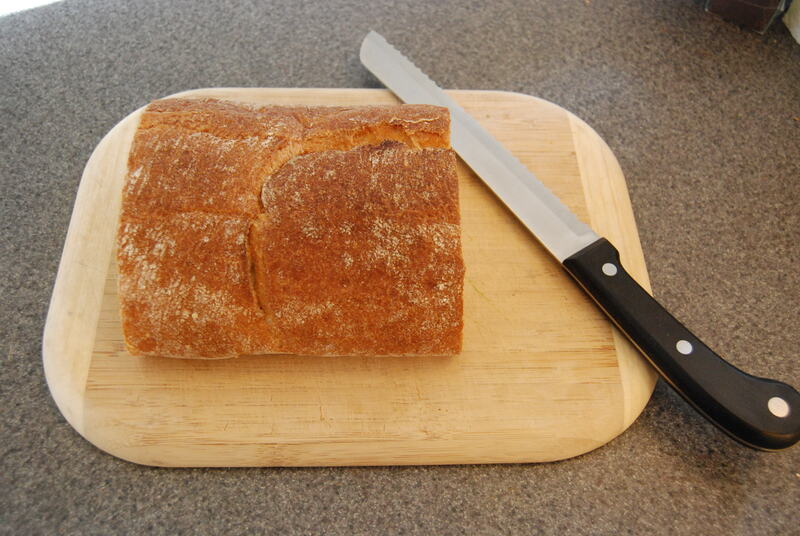 So, if I’m not pregnant and on intense carbo-load (which I am—on both counts), there’s usually some bread left over. What’s an Obscure lass to do? 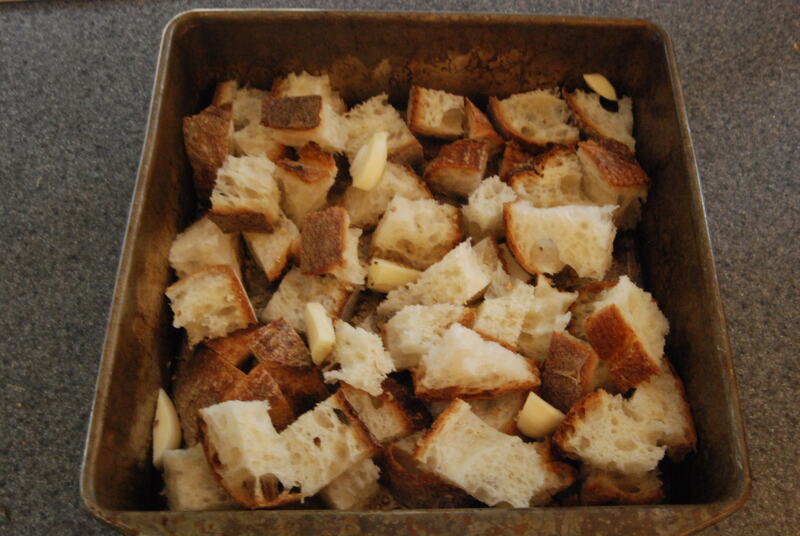 When life gives you bread, make croutons! If you haven’t the time to slice and toast seasoned bread cubes (it only takes about 20 minutes, and half that is cooking time; but I understand that sometimes those precious minutes are hard to find) then wrap your leftover bread in a plastic bag or plastic wrap. It will still be soft enough to slice, though a bit chewier than its fresh self. When you’ve got the time for making the most delicious croutons in the world (the restaurant and store-bought ones will shudder in inferiority) then first turn the oven on to 450 degrees. This is important—the oven should be hot, hence the pre-heat instructions on most recipes. A good, sharp bread knife is essential, and worth the expense, because the crust can begin to get a bit tough and rubbery after a couple days wrapped in plastic. Handful of herbs—all or a few of the following: rosemary, oregano, basil, parsley, thyme. Begin by slicing your bread and then cutting it into bite-size chunks. Layer the chunks in a single layer along the bottom of a rimmed cookie sheet, brownie pan, roasting pan, or whatever you’ve got that has a rim. Use whatever size you need, based on the amount of leftover bread you’ve got. Don’t use a flat cookie sheet, because if the oil runs off the edge, it could set your oven on fire. I speak from experience, and Ms. Obscure would like to help you learn from her mistakes. Once you’ve got your pile of bread cubes, coarsely chop your herbs and sprinkle them over the top. Scatter your chopped garlic and shake it all around a bit. 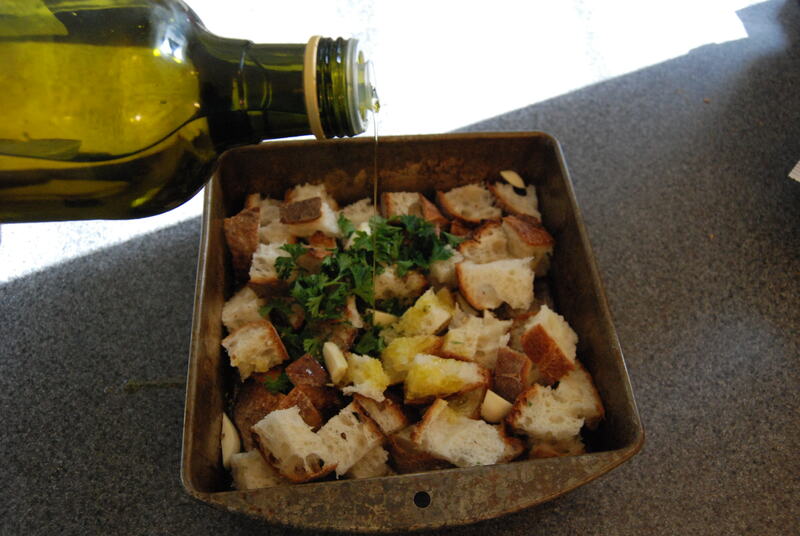 Then drizzle your olive oil on top, trying to get a little bit on each piece of bread. This is actually quite a bit of oil, but don’t worry about that. Olive oil is a ‘good fat’ and croutons on salad were not meant for stingy calorie counters. Shake the whole mixture around a bit more and then pop it into your hot oven for about 10 minutes, or until most of the pieces are light brown. Stir the bread as needed after 7 minutes or rotate the whole pan and bake for the remaining few minutes. 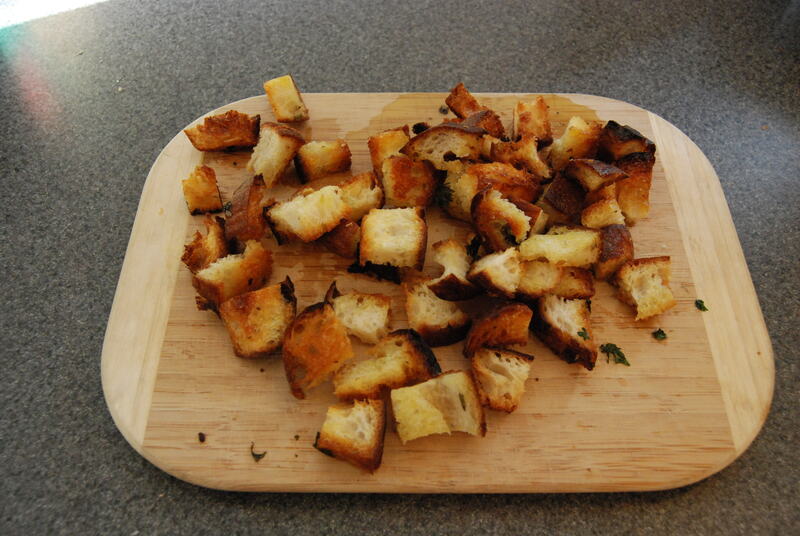 Ideally, your croutons should be golden brown, crunchy on the outside and give a little in the middle. 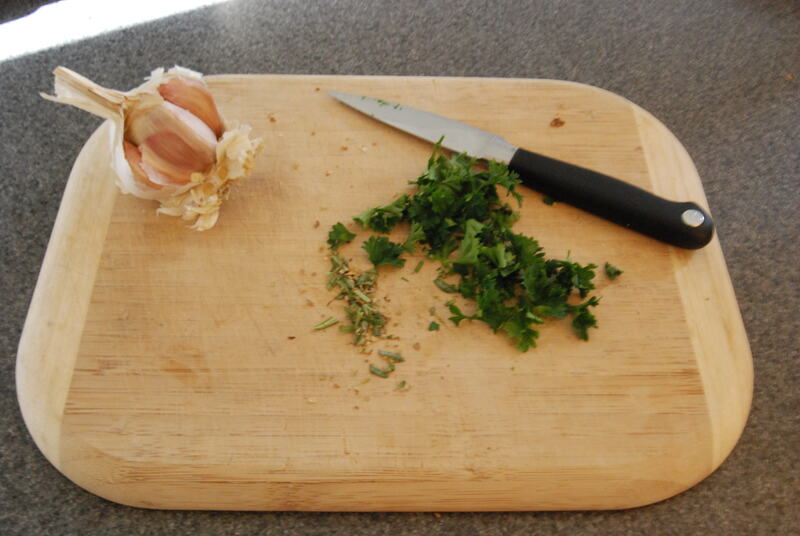 Discard the biggest chunks of herbs, and if you don’t like roasted garlic (are you crazy? !… okay, just kidding. Different strokes, etc.) then chuck those, too. Store in an air-tight container and use liberally on salad. Be sure to sample a few when they’re warm, too. No, seriously, just a few—you do want to leave a few for your salads.